Will Obama's war become his Vietnam? Washington (CNN) -- As President Obama announced he's sending more troops to Afghanistan, he also took on critics who made comparisons between the current situation and the war in Vietnam. Obama addressed those critics, who believe the area cannot be stabalized and think the United States should cut their losses and rapdily withdraw, by highlighting what he beileves are major differences between Vietnam and Afghanistan. "Unlike Vietnam, we are joined by a broad coalition of 43 nations that recognizes the legitimacy of our action," Obama said during his speech at West Point Tuesday night. "Unlike Vietnam, we are not facing a broad-based popular insurgency. And most importantly, unlike Vietnam, the American people were viciously attacked from Afghanistan, and remain a target for those same extremists who are plotting along its border." Experts say while there are similarities between the two conflicts, there are more differences. In March, Afghanistan will become America's longest war, surpassing the one in Vietnam, which cost more than 58,000 American lives. In 1965, President Johnson ordered combat troops to South Vietnam, adding to the 20,000 U.S. advisers who had been working with the South Vietnamese military. 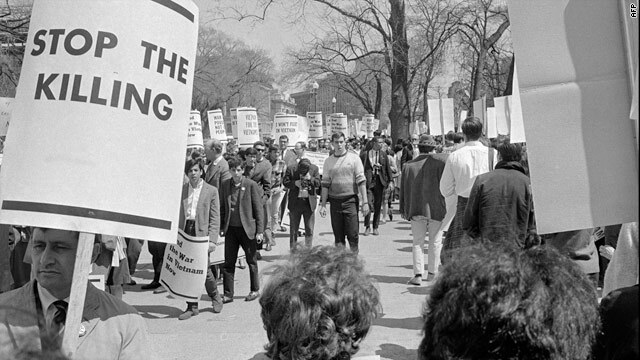 By 1968, forces in the country topped 500,000. Video: Is Obama keeping war promises? Analysts say that Obama will be faced with a similar quandary to the one that Johnson faced if conditions don't improve in Afghanistan, and public opinion of the war could drop to the lows that forced Johnson not to seek a second term. Eric Margolis, a veteran journalist and former Army soldier who fought in Vietnam, said the biggest problem the United States is facing now -- as it did in Vietnam -- is fighting the mostly poor, rural insurgents who live among Afghans. "It makes it very difficult to drive [insurgents] out, because they can stay there forever. ... They're at home. When we attack villages where they are, we kill a lot of civilians, causing an uproar and turning the people more against us." Peter Beinart, who wrote an article in October called, "Bury the Vietnam Analogy" on TheDailyBeast.com, has said there is a real sense of national identity for Afghans that wasn't seen in South Vietnam. "Afghanistan is a real country that Afghans generally believe in. They have an Afghan national identity. That didn't exist in South Vietnam," he said, adding that the Taliban is much less popular in Afghanistan than the Viet Cong was in South Vietnam. In Vietnam, the Communists controlled the nationalist movement and had the nationalist legitimacy. The Taliban, meanwhile, is not as organized as the Viet Cong and North Vietnamese Army were. Like in Vietnam, the government the U.S. supports in Afghanistan isn't supported by the majority and is tainted by charges of corruption. "In both cases, the government of Saigon [South Vietnam] and Kabul [Afghanistan] are heavily influenced by minorities. We have made our enemies [among] the ethnic majority in Afghanistan who are the Pashtuns -- pretty well cut them out of power," Margolis said. South Vietnamese President Ngo Dinh Diem was chastised for preventing free elections amid mounting concerns over corruption within his government. Diem's government was overthrown in a military coup, some charge supported by the United States. There are concerns that some of Afghan President Hamid Karzai's actions mirror those of Diem. Karzai held onto the presidency in recent elections that were criticized over claims of fraud by the incumbent. Karzai agreed to a runoff, but questions of corruption still plague Karzai and his government. Steve Clemons of the nonpartisan New America Foundation said that in the long run the fundamental question is: "Are we still dealing with a guy who is not only perhaps sitting on top of a mess of corruption? ... There is a concern that they're now helping to defend someone's moral code and structure that they oppose." That question was enough to compel U.S. ambassador to Afghanistan, Karl Eikenberry, to caution Obama not to send more troops to Afghanistan until the country had a more stable government.